I think we can all agree this provincial election has gotten pretty overheated. It’s warranted. There are genuine serious issues coming up about climate change and energy policies, human rights, and moral issues. There’s something else I’ve wanted to focus on, though: underdogs. There are hundreds of candidates running for office in this election, and though change is in the air, only 87 can become Members of the Legislative Assembly. I wanted to know what motivates the people running in tough ridings, the ones that have been impenetrable fortresses for other parties for years. Sitting in the passenger seat of his door-knocking volunteer’s car, Marlin Schmidt is swapping horror stories about the mosquitoes up north. Way up north. Schmidt’s a hydrogeologist for Alberta Environment in Edmonton now, but says his time working in the field in northern Canada shaped his journey from a young Reformer to an NDP candidate today. The riding Schmidt’s taken on is Edmonton-Gold Bar, and it’s been won by Liberals since 1986. Hugh MacDonald has been the MLA here since 1997, and only decided not to run this time around after running for the Liberal leadership and losing out to Raj Sherman. That’s a tough legacy to overcome for any candidate, and the new areas that have been added have mostly voted Tory before. But Schmidt’s been through similar battles before running federal races for the Member of Parliament in this area, Linda Duncan. Before she won, Rahim Jaffer seemed to have just as tight a grip on the riding for the Conservatives. I talked to Marlin Schmidt to see what he had to say about moving over to the NDP, the minor controversy over a public school trustee’s endorsement, and the conditions under which he loves strategic voting. Following Schmidt and his volunteer on the evening’s door-knocking route, I realize he’s tall enough to get swiped by most of the trees, so I try to veer to the edge of the sidewalk. As we walk, Schmidt jokes he’s been interested in politics since he was a kid because he his parents were always swearing at politicians on TV, and he wanted to find out what they were swearing about. His family moved around a lot when he was young, and Schmidt says he has a strong memory of growing up in Saskatchewan under Premier Grant Devine’s scandal-ridden Conservatives. The corruption of that party and its baker’s dozen of MLAs convicted of fraud “left a bit of a mark,” says Schmidt. The Reform Party seemed to capture the sense he felt of being alienated by the “Eastern bastards” when he was young, he says, and Reform got his vote in his first election. Eventually though, Schmidt realized he felt like the West was being cheated more by big oil and banking companies than by the government. It was living in northern Alberta with his young wife and working as an environmental consultant for oil and gas companies that guided his shift towards the NDP, he says. He felt frustrated that so much of his pricy consulting fee was going to shareholders, not the people doing work in the company. And eventually he got frustrated with his taxes, too — with how low they were getting. “Since I started working, my taxes have basically just been doing down,” Schmidt says. But the cost of saving for his kids’ post-secondary education and non-instructional fees kept going up. The NDP seemed to be a better fit for his belief that it’s easier to pay for the important things collectively. 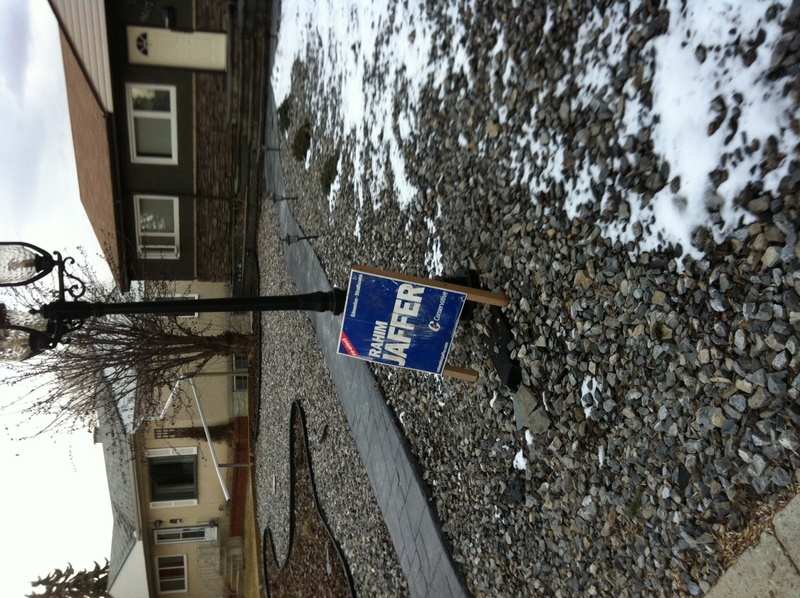 It’s easy to understand why he just walks past the houses with Wildrose signs on their lawn. It makes sense too that the longest conversation of his evening is at a house where a man tells him he’s worried about high taxes and wages squeezing out his small business. Schmidt stands at the door for a while trying to persuade the man that the NDP wants big corporations to pay their fair share, but would lower taxes for small businesses. The man nods, saying somebody’s got to pay for everything government does. I’m surprised to hear him tell Schmidt he thinks green concerns about the oil sands are also overblown, but that he’s rented a helicopter to see industry’s impact on the land, and walked through reclaimed forests to see what they look like for himself. “It’s not much of a forest,” he says. Although environmental issues play to Schmidt’s strengths, he gives a delicate answer to this potential voter. He talks about the real concerns he sees in his work at Alberta Environment, but agrees they’re occasionally blown out of proportion by advocacy groups. I ask Schmidt later why the NDP platform is so vague about environmental issues, and he admits it’s a third rail for their party in the same way moral issues are proving to be for Wildrose. “As soon as the NDP talk about the environment,” Schmidt says, “people think we want to shut down the oil sands.” So this election they’ve consciously decided to back down from the development slow-down they called for in 2008, and focus on issues like upgrading bitumen in Alberta. That issue has earned them attack ads from the Merit Contractors Assocation, which represents non-union contracting companies benefiting from the current setup of shipping unrefined oil out. Schmidt gets a pretty big smile talking about those ads. “Unless they’re a highly vindictive organization,” he argues, they wouldn’t attack the NDP unless they saw them as a credible threat. The one minor bump in Schmidt’s campaign so far has been Liberal candidate Josipa Petrunic’s campaign’s allegation that he received an illegal endorsement from Edmonton Public School Board trustee Sarah Hoffman. 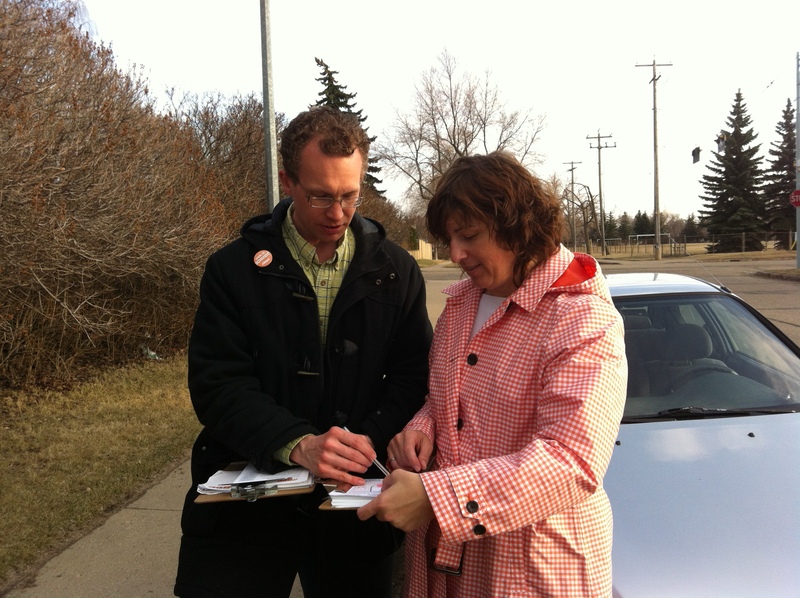 They say Hoffman’s endorsement breaks an Alberta School Board Association policy an abusing her position. To be clear, I spoke to Dave Colburn, Board Chair of the EPSB. He said they have no policy on the issue as long as the endorsement is personal. I asked whether it was a problem that Hoffman’s endorsement on Schmidt’s campaign literature names her as a trustee. He said unequivocally that their legal team has advised him she hasn’t violated any rules. As for Schmidt, he says he thinks it’s appropriate for elected officials to support other candidates as long as no public money is involved. Especially with so few progressives in Alberta, he says, they can’t wall each other off. Inexplicably, this house had a sign in their yard for Rahim Jaffer. He was the Conservative MP for this riding... federally... until 2008. The reason I’m standing awkwardly on the porch as Schmidt knocks on dozens of doors, of course, is I want to find out why he’s running for the NDP in a riding held by another party on the left for so long. It’s a question that comes from many people he talks to who’ve voted Liberal before. Schmidt has an answer ready when people argue the riding’s been held by them for decades. Hugh MacDonald, he argues, had strong trade union backing, and supported many issues the NDP champion. On the back of his pamphlets, a tiny bar graph reflects how hard he worked to battle the same argument campaigning for Linda Duncan. It shows Duncan was miles ahead of the Liberal candidate in the area during the 2011 election, and that definitely wasn’t always the case. For years, the Liberals argued they were the only credible threat to the Conservatives. There’s a website called Change Alberta endorsing “progressive” candidates with the best chance of winning competitive ridings all over the province. Though their methodology is a bit shaky, Schmidt has won them over in Edmonton-Gold Bar. Since the NDP so often end up on the losing end of strategic voting though, I ask him how he feels about that kind of endorsement. He’s not the kind of candidate who suddenly puts on a new mask every time he greets people at the door, and I can tell he’s struggling to give an intellectually honest answer. He says he’s trying to come up with a good argument, but there isn’t one. The pamphlet and the website help this time though, and he knows he needs to win. Come back tomorrow, when Lana Cuthbertson and I will profile Edmonton-Glenora candidate and former Alberta Party leader Sue Huff. I enjoyed your story. I especially liked the comment that Schmidt wants to pay more taxes. Seems to me that with more money in his pocket he could assemble like minded individuals, pool their resources and start heir own resource company that could pay more taxes. You see, thats how a strong democracy works(you know as opposed to borrow) in conjunction with market forces. People vote with their wallet for the things that they want top pay for. Schmidt stopped by my door also. I asked him how they were going to pay for more health care and education with the shrinkage of the royalty payments from oil and gas leaving a 5 billion dollar hole in the budget. He told me the NDP government would provide “better leadership”. Well, we have seen their better leadership, and there is now a 6.1 billion dollar hole in the budget. And they have lead us all the way to the bank to ask for a handout to keep the light on. Dont you find it ironic that they hate the banks, but when they want to spend more money then they make, thats where they traipse off to? It does make me giggle, but I guess thats just me.